Over the years, Fritz Lang’s “Metropolis” would prove a blueprint for black reichs and blade runners alike. 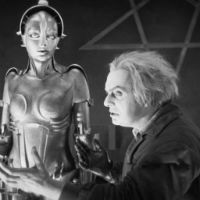 Over the years Metropolis would prove a blueprint for black reichs and blade runners alike, even when the only existing prints were copies of copies, until the earliest generation yet was discovered in Chile five years ago (be sure to watch 2010’s so-called “complete” version and not the one with the Giorgio Moroder soundtrack). Director Fritz Lang’s Olympian vision of proles in rebellion against the bosses in a dehumanized future looked less like a cautionary tale anticipating revolution and the downfall of the “Planners” than a thing of marvel to Hitler and Goebbels, and you almost can’t blame them, what with the towering architecture and cast of nearly 40,000. They might have had a thing for Brigitte Helm as the hot female robot, too. When Lang feared Nazi enthusiasm would only call attention to his Jewishness, the party’s minister of propaganda reportedly assured the filmmaker, “Herr Lang, we decide who’s Jewish and who isn’t.” Legend—too good in this case to discount even if it isn’t precisely accurate—has it that Lang caught a train to Paris within 24 hours, leaving behind his wife (and Metropolis screenwriter) Thea von Harbou, who already had made clear her preference for the führer.